It has become a custom in our family to enjoy a homemade pizza every Friday for supper. Our neighborhood has a small Farmers Market Friday afternoons. I like to walk down to stock up on produce for the week, including tomatoes for our pizza. I even have a pushcart just like both my grandmothers used to have in New York when I was a kid. This particular Friday was unusual in many ways. We had spent the previous eight days in San Diego Hospice ICC, saying a long good-bye to Larry’s mother. Although my mother-in-law was very elderly, it was a stressful and sad time for us and for her grandchildren. As my husband always says when death robs us of a loved one, “We are never ready”. So Friday began with Larry making some necessary phone calls while I plunged into piles of laundry and household chores. Midday, I suggested lunch at a quiet Greek restaurant, very pleasant. Larry, out of character, complained of being tired. We both thought it was pretty normal, under the circumstances, for both of us to feel fatigued. After a brief nap, Larry went off for his usual tennis match. For some reason, I decided to skip the market and made a quick trip to the grocery store instead. When Larry returned from tennis, we chatted briefly before he announced he wanted to lie down before taking a shower – peculiar, I thought. As I was signing a thank-you note to Hospice, I heard a loud crash and one of our cats ran out of our bedroom. I flew into the bedroom and found Larry collapsed on the floor. His face was ashen, he appeared mildly disoriented and sleepy. Although he weakly protested, I promptly dialed 911. As I described his condition to the dispatcher, I knew my husband was having a heart attack. My anxiety grew to a state of absolute terror. I shut the cats into Larry’s den, gathered his medicines and listened to the sirens as the paramedics and firefighters approached the house, within three minutes of my emergency call. Once at the ER, I was separated from Larry and two cardiac teams began to work on him. He looked dead. A nurse was assigned to deal with me, “…the nervous wife”. Thankfully, my stepson and his wife arrived and gave tremendous support. Larry was whisked up to the cardiac catheter center, his blood pressure dangerously low. Quickly stabilized, two stents opened the clogged artery, forty-two minutes from having entered the ER. Two days in the ICU were followed by another in the step-down unit, and, quite suddenly, Larry was discharged. It was Tuesday rush hour as we made the brief trip home from the hospital. We walked into the house, looked at one another and said, “Happy Valentine’s Day”. And then I made a pizza. I remembered how you wrote about dear Dylan and thought it would help me to write too – it did. I’m so happy that you were there and you knew what was happening. And I’m glad Larry is on the mend–take care of yourselves–you’ve both been through a lot. Big hugs! Thanks, sweet Barbara! We are definitely on the mend. The post helped me and Larry is his usual calm self. Liz, such a beautiful post! I hope that this is now all behind you. Here’s to many, many more Pizza Fridays! 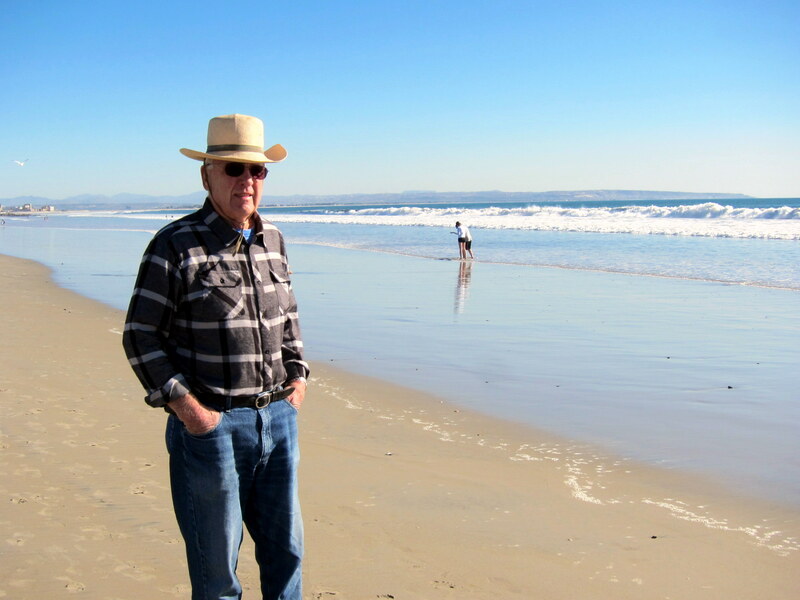 Thanks, Jayne – this is our favorite beach in Coronado, just across San Diego Bay. Thanks, Lynda, this kind of wrote itself – guess I needed this “non-foodie” post! Beautifully written and I feel priviledged that you shared it with us. To all the pizza nights in the future. Cheers. I just sat down and out it came- thanks for all your support! A heartfelt post (hah! That’s a pun) is just what you needed to write. This one got a great response. Glad to have nudged you. Your comment is the highlight of my day – thank you! You have taught me so much and continue to do so. I originally discovered your recipes through Jenny’s column. And I skipped over to your blog from food52. What a beautiful and brave post. Wishing you and Larry the best. Thanks and I hope you enjoy my blog! Love the picture, it is so Larry and as I was eating pizza tonight thought of the two of you. Liz, I’m so happy your husband, Larry is OK and that your sixth sense kicked in telling you not to go to the Farmers Market that day. What a Happy Valentines Day it was for the two of you! Thinking of you and hope the coming months will be smooth sailing! Thanks for your good wishes and so nice to hear from you, Daphne! Your story moved me to comment. What a terrifying experience to go through for both you and Larry. It reminds me to enjoy each moment with loved ones. My own baby sister is suffering from ALS, and her will to live is waning steadily. Whether we know what the future holds, or we come upon it unexpectedly, the terror is overwhelming. I bet that pizza tasted mighty good, and made with extra special love. I sincerely hope that your sister and her loved ones such as yourself are receiving support from your local hospice. I am so sorry for your plight. From your opening words I could sense the air of foreboding. My heart raced as your story unfolded. I am so happy that everything ended up well, even though I don’t know your husband, and spent mere minutes talking to you at Camp. But we are practically neighbors, and I’d love to get to know you better. Yes, and I realize now why I have been so stressed and cranky all week, wondering if Larry would make this birthday and remembering the 3 month anniversary today. You are too sweet. Really. Hug your loved ones close – I so envy you your large and extended family – thanks for reading. I’m glad that you followed your intuition and shared your experience on this blog. It makes us all aware how fragile our life is. Wishing you and Larry a speedy recovery and many more pizza nights together. Many thanks – we shared a pizza last night, as usual. Believe me, Lisa, I was far from calm…Thanks for taking the time to read this. My goodness. I knew of this as you’ve mentioned it, but I don’t think I’ve read about it until now. So happy you’re able to look back on this and move forward in your life together. It’s amazing that a small decision to drive instead of walk made such a difference. The memory of the entire experience feels etched in my mind – thank you for your comment.